My husband's employer recently introduced a Roth 401(k) choice in addition to its Traditional 401(k) plan. This new possibility for Roth savings made me wonder: should I fund a Roth account or put money inside a traditional one? The investment choices, administrative fees, etc. should be the same for both Roth and traditional accounts within a certain employer's 401(k) plan. In addition, the money invested within either can grow tax-free. Contributions to a traditional 401(k) reduce taxable income whereas Roth contributions don't reduce taxable income. In the years prior to retirement, we'll save on income taxes when we contribute to a traditional account. Withdrawals from a traditional account are taxed at ordinary income rates while withdrawals from a Roth account are tax-free in retirement. In our retirement years, we'll avoid income taxes when we take money from the Roth 401(k). Both can be good. But which is better? Generally, the debate about the type of account to fund centers on whether our tax rate will be higher while 1) we're working or 2) we're spending in retirement. I'm not good with abstract thinking. So I decided to run the numbers to see how net worth could be impacted by being taxed now vs. being taxed later. I've seen analyses that compare the value of say $1 million in a Roth account vs. the same amount in a traditional one. Of course it makes more sense to have a million dollars in a Roth account (which we can withdraw tax-free) vs. the same amount in a traditional account (on which we'll pay taxes). It's easy but too simplistic to look at this type of result and declare victory for the Roth. For a fairer comparison, I'll run calculations that measure the tax savings generated by traditional contributions and the tax benefits of Roth withdrawals in retirement. I'll analyze what happens to an investor's overall net worth when 1) money is invested only within a Roth 401(k) and 2) money is invested in a Traditional 401(k) and tax savings from the traditional contribution are invested in a Roth IRA. Here's a spreadsheet on Google Sheets to show my work: Investing to Thrive's Traditional 401(k) vs. Roth 401(k) Comparison. To keep things simple, let's say I live in a state without state income tax and never open a regular brokerage account. My only source of income is from working and retirement accounts. Using this assumption, we're eliminating the possibility of taxable investments. Further, again for simplicity's sake, I'll assume an inflation rate of 0% and no changes in income tax rates, standard deductions (with the exception of the more generous deduction for taxpayers 65 and up), personal exemptions, or the tax structure throughout the working and retirement years. In my first sheet (Income + Savings | Working) within the spreadsheet are the numbers to illustrate this scenario. The account balance of the 401(k) — whether traditional or Roth — would grow to $1,132,832.11. If the money had been placed in a traditional 401(k) account, annual tax savings of $2,500 could be channeled to a Roth IRA and this account would grow to $283,208.03. So, the net worth of the traditional saver (who also contributed to a Roth IRA) could grow to $1,416,040.14 at retirement whereas the Roth 401(k) saver would have a net worth of $1,132,832.11. At first glance, I'd be happy about the higher net worth associated with the traditional 401(k) plan. But then I'd wonder if higher taxes associated with withdrawals from the traditional investment in retirement would erode this savings. Rather than wondering or guessing, I'll look at the numbers for this situation. Tax regulations also allow retirement savers with investments held in a Roth 401(k) to do a tax-free rollover into a Roth IRA. This move allows retirees to skip required minimum distributions (RMDs). RMDs are IRS-mandated withdrawals during retirement. Money can continue to grow tax-free inside a Roth IRA. For this comparison, let's see what happens to my investment totals when I maintain my Roth money inside the 401(k) and withdraw equal amounts out of the traditional 401(k) and Roth 401(k). The first step for the retirement calculations is to monitor the value of my 401(k). For this illustration, I'll take 4% withdrawals during the early days of retirement and then RMDs as specified by the IRS during the second phase of retirement. These withdrawals will happen at the end of the year, giving my account balances time to grow throughout the year. The second tab in the spreadsheet (401(k)s | Retirement) indicates how the account value changes over time. Next, I'll figure my taxes each year. The third tab in the spreadsheet (Income + Taxes | Retirement) projects taxable income and tax liability based on retirement account distributions and Social Security benefits. In this illustration, the retirement saver will owe taxes on Social Security benefits with a traditional 401(k) but avoid taxes on these benefits with the Roth 401(k). Like most tax calculations, determining whether I'll owe taxes on Social Security benefits can be complicated; basically, though, if my combined income (regular income plus half of Social Security) exceeds a certain threshold (such as $34,000 for a taxpayer filing single) then I'll owe taxes on a large percentage of my benefits. For those with a traditional 401(k) and both the ability and foresight to fund a Roth IRA, the Roth IRA can become the source of funds for tax payments in retirement. An illustration of how money is drawn from the Roth IRA is contained in the fourth tab (Roth IRA | Retirement). In this scenario, money is withdrawn from the Roth IRA to make tax payments only. The investment balance continues to increase because annual investment growth exceeds taxes. The fifth and final tab (Net Worth | Retirement) illustrates the changes in account balances during retirement. In this case, I'd have a higher net worth if I put money in a traditional 401(k) and applied savings to a Roth IRA instead of contributing to the Roth 401(k) only. The calculations in this scenario show me that contributing to a traditional 401(k) could make more sense than putting money in a Roth 401(k) — if I applied tax savings wisely. Investing tax savings generated by making traditional 401(k) contributions can allow me to accumulate investments to fund my tax bill in retirement. Putting this money inside a Roth IRA will allow me to withdraw funds tax-free in retirement, helping to preserve wealth. Even if I must take RMDs from a traditional 401(k) and my combined income results in taxation of some Social Security benefits, I could benefit from the early tax savings and compound growth associated the traditional approach. The dollar amount of investments within each account makes a difference in the effectiveness of the strategy. I should consider monitoring account balances and making adjustments as I move closer to retirement. Investing in accounts with various tax structures (being tax diversified) can be helpful as circumstances change. The seemingly ambivalent advice about putting money in many types of accounts, just in case, is much smarter than it may sound. Different financial circumstances could change results. Different inputs could include: higher (or lower) income; higher (or lower) tax rates in retirement including high state income taxes; outside earnings in retirement from taxable investments, rental properties, and pension benefits; greater inflation; and higher (or lower returns) on my investments. This exercise helped me understand how personalized the discussion on funding a traditional 401(k) or Roth 401(k) should be. 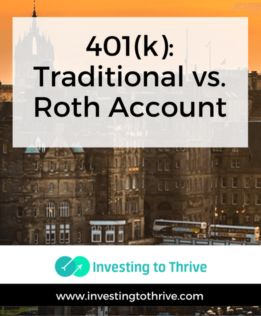 Are you funding a traditional account, Roth account, or both? How did you decide what to do?